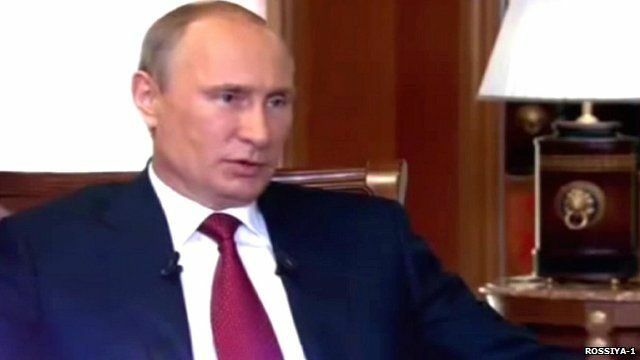 Putin: 'Russia is not the aggressor' Jump to media player Russian President Vladimir Putin says the West is responsible for the deterioration in its relations with Moscow, saying the West is the aggressor, not Russia. 'Putin is a bigger threat than IS' Jump to media player Russian former chess master turned politician, Garry Kasparov, says Russia's President Putin is a bigger threat than so-called Islamic State. Putin visiting Crimea amid tension Jump to media player Russian President Vladimir Putin is visiting Crimea where he is due to make a speech and meet local people. PM vows to up pressure on Putin Jump to media player Prime Minister David Cameron has said the EU and US should use their "economic power" to put pressure on Russia with regard to events in eastern Ukraine. Obama: 'G7 ready to impose costs' Jump to media player US President Barack Obama has warned Russia that the G7 nations are ready to impose additional sanctions over its actions in Ukraine. Russian President Vladimir Putin has admitted for the first time that the plan to annex Crimea was ordered weeks before the referendum on self-determination. Mr Putin said in a documentary called Crimea: The Road to Motherland, to be shown on state-run TV channel Rossiya-1, that he had ordered work on "returning Crimea" to begin at an all-night meeting on 22 February. The meeting was called to plan the rescue of Ukraine's deposed president, Viktor Yanukovych. The trailer for the documentary was broadcast on Sunday night with no release date announced.